Stainless steel case with a white leather strap. Fixed stainless steel bezel. White dial with silver-tone hands and index hour markers. Automatic movement. Scratch resistant sapphire crystal. Skeleton case back. Case diameter: 32 mm. Case thickness: 10 mm. Round case shape. Band width: 18 mm. Deployment clasp with push button release. Water resistant at 100 meters / 330 feet. Casual watch style. Item Variations: T035 207 16 011 00, T035-207-16-011-00, T035/207/16/011/00, T0352071601100. 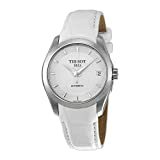 Tissot Couturier Automatic White Dial White Leather Ladies Watch T0352071601100.